Empowered by our expert’s in-house designing unit, we are engaged in offering a wide assortment of Silver plated figures. A.Fi.6 silver made with the article figure sculpture and that a very good design created by silver article and all work hand made . This Silver Elephant is easy on maintenance has a silver tone finish. 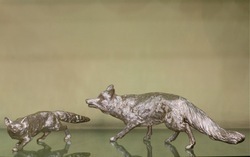 We offer an alluring collection of Animal Figures that comes with a combination of polished silver finish. With the assistance of our skilled craftsmen, we design our range that is adapted from city clay pottery. The range that we offer finds extensive usage in meeting the decoration demands of houses and other commercial establishments. 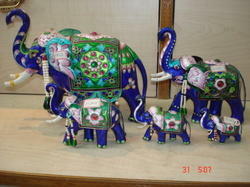 We offer a grand collection of silverhollow peacock in matchless designs. Possessing magnificent and intricate design, our range is known for their lasting finish and durability. - Minimum order quantity: As required by the clients. SP031e : Silver Filigree Peacock Ship. Weight 110 grams. Rs.8500/- (Approx). Size 7.5" / 10" . We are providing you the best range of Silver article such as Silver Article, Silver Purse, Silver Animals, Silver Tea Set, Silver Thali Set, Silver Antique Items, Silver Photo Frame , Silver Pot, Silver Car, Silver Candle Stand and many more items with effective & timely delivery.